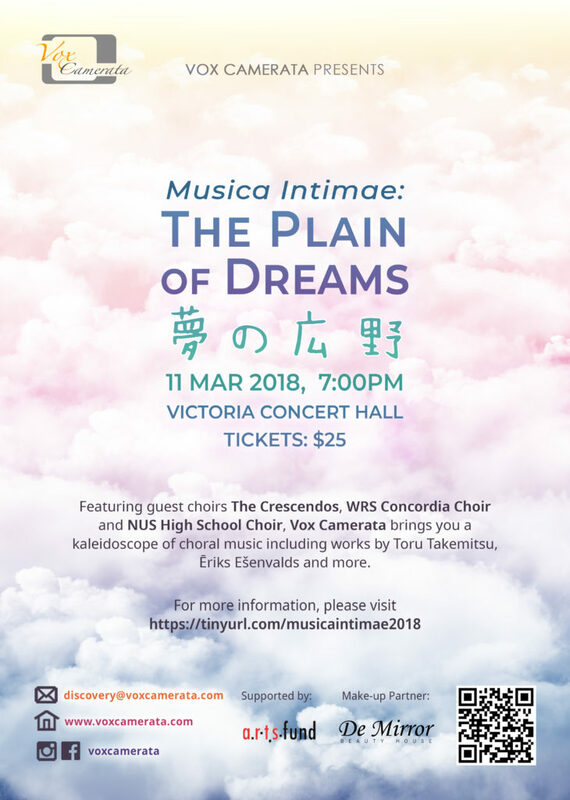 In March 2018, Vox Camerata presents Musica Intimae 夢の広野 (Yume no Kouya: The Plain of Dreams). Alongside our long-time friend Benedict Goh with The Crescendos, guest choirs, WRS Concordia Choir and NUS High School Choir, we will bring you a kaleidoscope of choral music spanning across the globe. This epic journey of dreamlike soundscapes will transport you from the cold reaches of the Baltic Seas with Ēriks Ešenvalds’ O Salutaris Hostia to the majestic plains of South Africa with Christopher Tin’s Baba Yetu, and Indodana arranged by Ralf Schmidt and Michael Barrett. Completing our journey of song, we also bring a collection of Japanese art songs by Toru Takemitsu and Kentaro Saro that speaks of delight, nostalgia, love and a hope for a better tomorrow, reflecting the journey of music making that bind us, our guest performers and audiences alike. Musica Intimae: The Plain of Dreams is supported by Arts Fund. In support of Beyond Social Services and Singapore Cancer Society, the choir believes in making good choral music accessible to anyone regardless of musical background, experience and expertise.How this works. It’s as simple as that! Buy a Beneficiary ticket today and help make good music accessible! Beyond Social Services is a charity dedicated to helping children and youths from less privileged backgrounds break away from the poverty cycle. We provide guidance, care and resources that enable families and communities to keep their young people in school and on track to a brighter future. We are currently operating in 5 rental housing neighbourhoods comprising 47 blocks. At present, we have reached 7444 children and youth under 20 years old from 3597 families in these neighbourhoods where we facilitate mutual help and cultivate a strong community spirit among residents. We believe that involving and organising the residents in these neighbourhoods creates a lasting and sustainable impact on the environment children and youth are raised in. To find out more, please visit www.beyond.org.sg or check out their video! Singapore Cancer Society is a community-based voluntary welfare organisation dedicated to maximising life by minimising the impact of cancer through research and advocacy, public education, screening, financial assistance, patient services and support, and rehabilitation. We are looking for patrons of the arts! Simply donate $100, $200 or $500 and you’ll receive 1, 2 and 3 pairs of complimentary tickets to our concert respectively. Upkeeping the choir and producing the concert requires a huge amount of resources and we are always grateful to family, friends and fans who make what we love doing possible. The funds collected to be used to support our room rental (and make it an affordable space for all!) and electricity bills, purchase of music scores and licenses to perform. 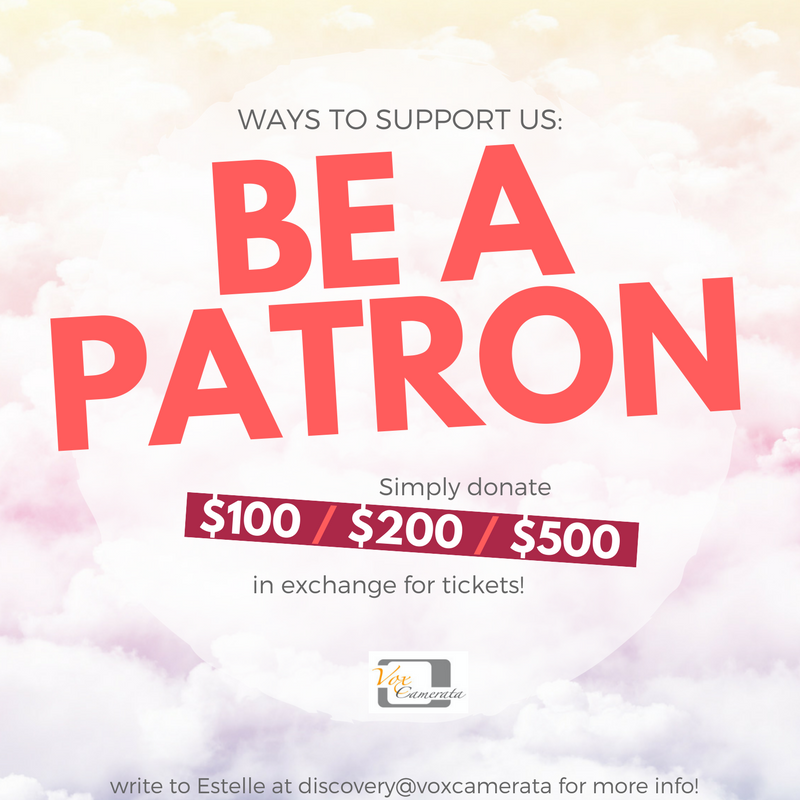 If you would like to support us, simply write to Estelle at discovery@voxcamerata.com with the title “Patron of MI2018” and indicate the amount you wish to donate. Vox Camerata is not only motivated to ensure choral music is accessible to everyone, we also want to do our part to support the local arts community. As a group made up of volunteer singers, corporate sponsorships are important in fulfilling our goals of making the arts accessible and making arts spaces affordable to local arts groups. If you believe in your goals and would like to come on board as a corporate sponsor, simply write to Estelle at discovery@voxcamerata.com. You may find our proposal here – we are more than happy to work with you and your company! For enquiries, write to discovery@voxcamerata.com. For media, address your mail to Estelle. For ticketing, address your email to Debbie.